The homies at BlackFlag Shoppe have put together a benefit showcase this Sunday in Clifton, NJ. Come one, come all it's free... just bring something to donate First Aid Kits, clothing, Toys, Water and all that good stuff for the good people in need. They will be having a dope artist showcase performing for you all so be there and ready to give, and music you shall receive. 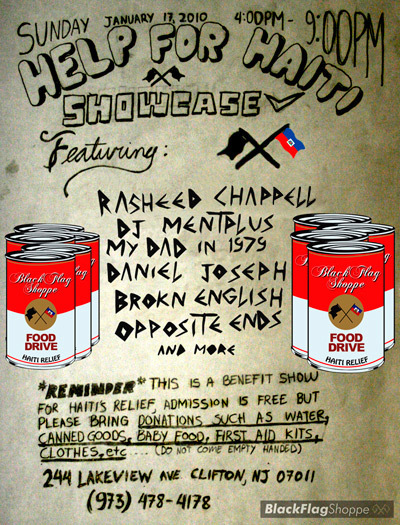 BFS "HELP FOR HAITI' Benefit Showcase. We ask that you join us in our efforts to "Help Haiti", We are fortunate enough to have gotten to know so many of you, and we know that your generosity is not a question, Please reach out to family and friends and have them join the cause!! Your generosity is Greatly Appreciated!! A Special thanks to all the artist who volunteered the time and efforts thus far!! Come One Come All. Our hearts and prayers are still with the people of Haiti.